An estimated 11.1 million unauthorized immigrants lived in the U.S. in 2014, according to a new Pew Research Center estimate based on government data. This population has remained essentially stable since 2009 after nearly two decades of changes. The recent overall stability contrasts with past trends. The unauthorized immigrant population rose rapidly during the 1990s and early 2000s, from an estimated 3.5 million in 1990 to a peak of 12.2 million in 2007. It then dropped sharply during the Great Recession of 2007-09, mainly because of a decrease in unauthorized immigrants from Mexico. The number of unauthorized immigrants from Mexico continued to decline from 2009 to 2014, but that decrease was roughly offset by an increase in unauthorized immigrants from other parts of the world, mainly Asia, Central America and sub-Saharan Africa. The overall estimate has fluctuated little in recent years because the number of new unauthorized immigrants is roughly equal to the number who are deported, leave the U.S. on their own, convert to legal status, or (in a small number of cases) die, according to the Pew Research Center analysis. The new unauthorized immigrant total includes people who cross the border illegally as well as those who arrive with legal visas and remain in the U.S. after their visas expire. The Center estimates that, since 2009, there has been an average of about 350,000 new unauthorized immigrants each year. Of these, about 100,000 are Mexican, a much smaller share than in the past. In the years leading up to the Great Recession, Mexicans represented about half of new unauthorized immigrants. Due to the slowdown in new illegal immigration since the onset of the recession, unauthorized immigrants are less likely than those in the past to be recent arrivals. 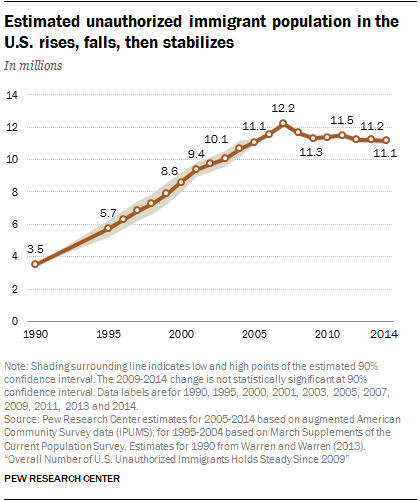 The share of unauthorized-immigrant adults who have lived in the U.S. for a decade or more has risen, from 41% in 2005 to 66% in 2014, according to the Center’s new estimates. Only 14% in 2014 had lived in the U.S. for less than five years, compared with 31% in 2005. Pew Research Center estimates are based on data from the U.S. Census Bureau’s Current Population Survey and American Community Survey, using the widely accepted “residual method.” The estimate includes about 10% of unauthorized immigrants who have been granted temporary protection from deportation under President Barack Obama’s 2012 Deferred Action for Childhood Arrivals and the federal government’s Temporary Protected Status for those potentially affected by disease, natural disaster or conflict in their home countries. The estimate also includes some people who applied for asylum status but whose applications have not been processed. Note: This is an update of a post originally published on July 22, 2015. The original post included a preliminary estimate of 11.3 million for the U.S. unauthorized immigrant population in 2014.